Stuck for routines in your daily dozen? Don't have time to make it to a gym? 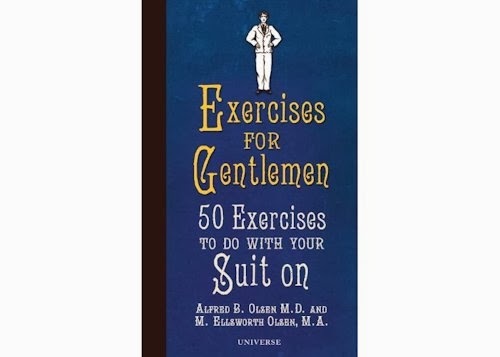 You won't have these issues (blatant excuses) if you obtain a copy of Exercises for Gentlemen: 50 Exercises to Do with Your Suit on [Amazon]. The book is produced by our good friends at the National Trust by arrangement with Ivy Press, and is based on a 1910 publication called The School of Health by Alfred B. Olsen M.D. and M. Ellsworth Olsen M.A.. 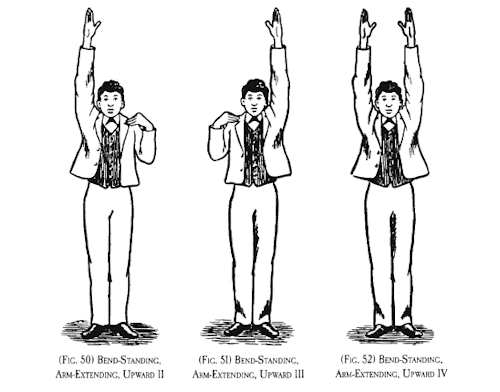 The book contains illustrated instructions for exercises you can do whilst standing or sitting (suit on), as well as tips on personal hygiene and bathing (suit off) — to 'cultivate simple, natural habits' and 'turn one's back on the soul-deadening artificialities and machine methods, and the mad, feverish rush after wealth which are eating into the very heart of society'. As they say, 'flabby muscles may be taken to denote a general mental, if not moral, flabbiness'. We have been warned.